How Have Atletico Madrid Become Real's Not-so Noisy Neighbour? Ever since Atletico Madrid won La Liga back in the 2013-14 season, they have established themselves as a real European powerhouse. Barcelona and Real Madrid dominate the scene in Spain and when Real's noisy neighbours came along and trumped them both in 2014, it was clear there was a new kid on the block. Atletico manager Diego Simeone was the mastermind behind his side's domestic success, and it could have been more had Real not beaten them 4-1 in a thrilling Champions League Final the same year. Simeone has managed to keep his side in contention for the title ever since, with Atletico finishing three points off the top last year when Barcelona lifted the trophy. However, the Vicente Calderon outfit haven't been up to scratch this season, and Real Madrid are currently 4/9 favourites in La Liga betting to lift the title; they also have a game in hand on second-placed Barcelona. It's shaping up to be another exciting installation of La Liga that will come right down to the wire. Atletico sit narrowly third behind Spain's big two, but they haven't secured a top-three finish just yet as Sevilla are breathing down their necks. With their top three finish still in question, Atletico fans are racking their brains at what's gone wrong this season. The side haven't played particularly bad and, of course, a top-three, even fourth-placed, finish in this league is still a great achievement. But after such an impressive season in the 13/14 campaign, nobody can blame the fans for wanting and expecting more. Atletico have failed to compete with the big boys this season: they haven't beaten Real Madrid or Barcelona in the league so far and in a title fight you need to beat your competitors. Real beat them 3-0 in the first meeting of the season and they drew 1-1 at the Bernabeu. Meanwhile, they drew 1-1 with Barcelona at the Nou Camp, with the Catalan side then managing a 2-1 victory in Atletico's back yard. Simeone admitted the title race was over even back in February before his side's draw with Barcelona, saying: "We see these three points, not so much against a direct rival, but in a battle for third spot. "A few fans may point the finger at Simeone for not believing in a title race so early on and blame him as the reason for the side not competing at the top. 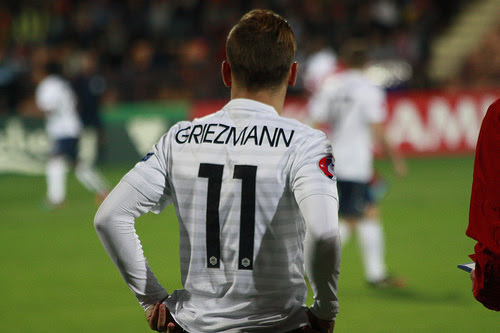 Another factor to consider is Antonie Griezmann. It feels like the whole world has been chasing the Atletico man's signature this season and it may have had a very negative effect on not only his own performance but the performance of his team-mates. When one player is singled out as the best in a team and is being chased by numerous competitors, it can't be something that goes unnoticed and it must have had an effect on the whole team. Griezmann has scored 16 goals in 32 league appearances this season but the rest of his teammates simply haven't stepped up to his ability. Kevin Gameiro has 10 in the league; Fernando Torres and Yannick Ferreira Carrasco both have five each as well. Perhaps they have focused a little too much on the Champions League. It's all well and good trying to perform in Europe but if you're not performing in the league then there will be no future opportunities for European football. However, Atletico can't blame anything on their commitments in other competitions; they play in the Champions League every year and have managed to compete in La Liga before.